Improved Economist front page by Thomas Widmann, on Flickr. 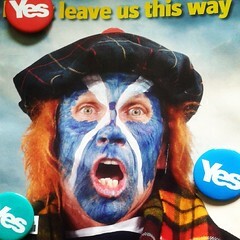 In the most recent issue of The Economist, there are four articles about Scottish independence, as well as a photo of a glaikit-looking man with a bad Saltire facepaint and a Buchanan-tartan scarf (which isn’t a good way to win me over, given that I’ve married into the Buchanan clan). There are lots of errors, omissions and tendentious vocabulary in all the articles, so a full fisk would be a massive undertaking. Instead, I’ve picked out a few bits and pieces below. The leader sets the tone and places The Economist — yet again — firmly in the No camp. Britain doesn’t feel like a nation on the verge of cracking up. Many have clutched patriotic flags and wept this summer — but most of them were fans of the English football team. This might be how it felt in London, but obviously there weren’t many supporters of the English football team in Scotland, and the independence campaign is now starting to be very visible north of the border. The person who wrote this clearly hasn’t been to Scotland recently. A democratic, peaceful, well-governed nation state is a blessing which should not be casually thrown away. Is the UK democratic? The unelected House of Lords still plays a major role! Is the UK peaceful? There were riots in London not that long ago, and I doubt people in Iraq and Afghanistan would praise British peacefulness! Is the UK well-governed? There are new scandals all the time, showing us the level of nepotism and corruption that is commonplace in Westminster! Is the UK a nation state? Better Together campaigners keep telling us it’s a union of nations, and not a nation state at all! Tellingly, most members of ethnic minorities describe themselves as British rather than English or Scottish. While that’s true in England, it again shows they haven’t been to Scotland recently. Here ethnic minorities happily call themselves Italian Scots, Pakistani Scots, English Scots, and so on. The impression is of a party promising Scandinavian-style public services supported by taxation closer to American levels. That is fantasy, not socialism. This is of course a complete misrepresentation of reality. Nobody has talked about American levels of taxation, but simply a slightly lower corporation tax than in the rUK in order to attract more businesses. And although Scandinavian-style public services would be great, that’s a long-term ambition. Here and now we’re talking about practical measures such as providing enough childcare to allow women to return to the labour market — something which will probably be self-financing. Although the idea behind this article (to discuss the independence negotiation options) is great, it’s unfortunately full of errors. The timetable will be contentious, too. Mr Salmond claims that Scotland could become independent on March 23rd 2016 […]. That is fanciful. […] [S]uch breakneck negotiations will store up problems for the future. […] A deadline of 2018 would be more sensible. Past break-ups suggest that even after independence day, fiddly negotiations will continue. The Czechs and Slovaks only reached agreement on Czechoslovakia’s gold reserves in 1999, seven years after they had opted to break up. As I’ve discussed many times in the past, the UK will be almost ungovernable between a Yes vote and Scottish independence day because you cannot implement anything that the Scottish Government doesn’t agree with. This means that a year and a half is probably the maximum Westminster can put up with, so negotiating until 2018 is simply not going to happen. It’s much more likely deals will quickly be made on the really important issues, followed by further negotiations after independence day, just like the Czechs and Slovaks did. The second [principle] should be that movable assets (such as arms) be split proportionately and that immovable ones (such as public buildings) remains with the state they are in. This might be a fine principle, but I guess it means that Scotland gets the nuclear weapons, which Westminster might not particularly like. Also, lots of shared institutions are placed in London, so giving them all to the rUK without any compensation might be unfair. [Y]ou will need to strike a grand bargain on defence. This may involve the RUK supporting Scotland’s NATO application and helping it assemble viable armed forces, in return for a long-term deal to postpone Trident’s move (something akin to Britain’ 99-year lease of Hong Kong from China). This is simply not going to happen. The SNP has been very explicit that they will not accept a long-term deal that keeps Trident in Scotland. Also, NATO isn’t that important to most Scots, so it’s not an efficient threat to make people accept Trident. NATO might also not want a huge hole in the middle of their territory, so I’d be surprised if they decided to be too bloody-minded about Trident. It would make little sense to insist on splitting the BBC, which benefits from economies of scale and could adopt a federal structure fairly easily. They want us to keep the Westminster Propaganda Corporation?!? This is simply not going to happen. We’re going to create our own public-service broadcaster, and we’ll agree a deal (like Ireland’s) that’ll allow us to watch the BBC, too. [A]fter independence the RUK could well opt to import cheaper green electricity from continental Europe. Would it really be cheaper? But even if that was the case, the cables aren’t there — the existing ones are already running at full capacity. So they couldn’t do this immediately. [Scotland will need] a dialling code (+424 is the most likely choice) and an internet domain (though the Seychelles have nabbed .sc, and Sierra Leone has .sl). It’s good to see that The Economist reads Arc of Prosperity (this and this). I just wish they would read the newer articles, too. This final article deals with the economic aspects, but unfortunately they’re being unnecessarily negative. [O]ver the next 50 years, the Scottish workforce will actually shrink (the rest of Britain’s will grow). The number of pensioners will rise. The forecast that these numbers stem from are showing what will happen if Scotland remains part of the UK. In other words, as a British region, Scotland will grow older and poorer. This needs to change, but that requires access to some policy levers that are only available to independent countries (such as immigration policies). Excluding oil, Scotland ran a public-sector deficit of £14 billion in 2012-13. At 11% of GDP that is a bigger gap than in crisis-stricken Greece and Ireland. Excluding oil is crazy, given it’s there at the moment. Also, once you subtract the costs of Trident, HS2 or many other of Westminster’s white elephants, the deficit shrinks to much more reasonable levels. Scottish productivity is 11% lower than the rest of Britain’s; anaemic exporting, together with a shortage of innovative firms and low R&D investment, helps to explain this lag. It’s true that Scotland has problems in these areas, but that’s because it’s been impossible to fix them while part of the UK. As an independent country we can do something about this — for instance by making it worthwhile for companies to invest more in R&D. To sum up, The Economist managed to disappoint again — although this issue wasn’t nearly as abusive as their infamous Skintland front page. I had hoped they would finally have sent some unbiased reporters to Scotland to find out exactly what is happening up here, but I guess they’re too much a part of the Westminster bubble. @arcofprosperity A detail, but Canada doesn’t have its own international dialling code. How do 800-numbers work in Canada then? No idea! Scotland wouldn’t necessarily need a new international dialling code. The USA, Canada, and a good chunk of the Caribbean share +1. True, but European countries tend to have their own codes. The Economist used to have well written, well researched in depth articles. But I am talking about 25 years ago. I really liked it in the 90s. They were willing to think brave new thoughts about the EU, for instance.